Freeriding is – next to racing – the ultimate discipline in winter sports. Away from the pistes, atop lonely slopes or down steep gorges, we’ll be right beside you on the search for that indescribable powder rush. We also offer ski or snowboard tours. Far away from lifts and pistes, we will make our way up (often untouched) mountain slopes, until we reach the summit and can take in the 360-degree breath-taking panorama of Tirol. ..so safety is without a doubt our top priority! We provide you with LVS equipment, and of course ensure you are confident using it in a very hands-on lesson. 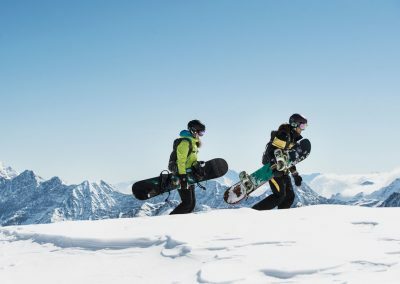 Please note: it is absolutely necessary to have an established ski- or snowboarding technique before embarking on a freeride. By acquiring the correct climbing and freeriding technique, you’ll begin to trust your interpretation of the landscape more, and in doing so, have more fun. With every ski tour, you will receive safety advice from us. We’ll teach and advise you on the avalanche danger, LVS search, plan the tour together, look for tracks in the snow and much more – so that not just we, but also you will have a sharper eye for danger!